My very first Serial Experiments Lain work. The Navi used in Serial Experiments Lain is generally considered short for Navigator. In Hebrew, however, as I recently learnt, Navi also means prophet. The English word prophet usually denotes an ability to see and speak of the future. The emphasis of the Navi in Hebrew, however, is on his/her relationship to and ability to communicate with God. Seemed like a theme befitting Lain. 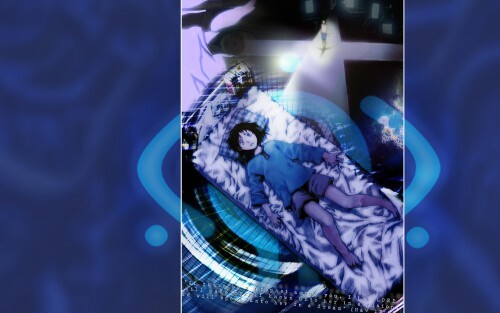 The core image of Lain lying on her bed, all freaked-out, is a scan from The Nightmare of Fabrication. So I added the following faux (paraphrased) Scripture: "If there be a prophet among you, I the LORD will make myself known unto her in a vision, and will speak unto her in a dream" (Nav 12:6). P.S. I only very recently discovered Serial Experiments Lain. And I am now completely overtaken by it! Don't worry. I'm still me. :) Or am I? I'm actually so new to Lain that I'm probably not really qualified yet to make Lain work; but the heart runneth over, prompting me to express my love for Lain, and I've learnt not to ignore such calls. P.S. Wallpaper version of a work I recently uploaded to Deviant Art. Lain Iz Scared Inside NAVI, Awesome!